Is Lou Whitaker a Hall of Famer? The case is very compelling, especially when compared to Hall of Fame contemporary Ryne Sandberg. Unfortunately, consideration of that question came to an abrupt end when an inexplicable lack of support from the BBWAA resulted in his name being dropped from the ballot after his first year of eligibility. Unless the Hall of Fame decides to reinstate Whitaker, the only hope for the Tigers’ second baseman will come from the Veteran’s committee. And, that’s probably just as well. In 1980, Ron Santo was dropped from the ballot in his first year of eligibility, and reinstatement did little to help his chances at enshrinement. From 1985 to 1998, the BBWAA continued to pass over Santo, and then the Veterans’ committee upheld the snub for 12 more years until his posthumous selection in November. With Santo’s pending enshrinement, Whitaker may now be the best player not in the Hall of Fame (excluding those players who have fallen under the cloud of steroid vigilantism). However, my objective isn’t to regurgitate the same argument that has been made so convincingly by many others. After all, considering the case of Santo, there will likely be plenty of time to debate Whitaker’s Hall of Fame credentials. Rather, what interests me most about the Tigers’ second baseman is not the overall value of his career, but how strongly, and quietly, it ended. In terms of OPS+, Lou Whitaker’s last five seasons were his best. Although other spans yielded a higher cumulative WAR, it should be noted that his last two years were shortened because of the strike that ended the 1994 season and an injury that may have been related to the abrupt beginning to the 1995 season. Regardless, in the last five seasons of his career, he compiled a WAR of 19.6, which ranks as the 24th highest total by any position player since 1901. By removing the Hall of Famers from that list, Whitaker moves all the way up to 13th, and three players (Barry Bonds, Shoeless Joe Jackson, and Mark McGwire) ahead of him would likely have been enshrined if not for off field allegations of impropriety. So, if he was still playing well, why did Whitaker decide to retire? Interestingly, for a player of his stature, there is very little information available to answer that question. 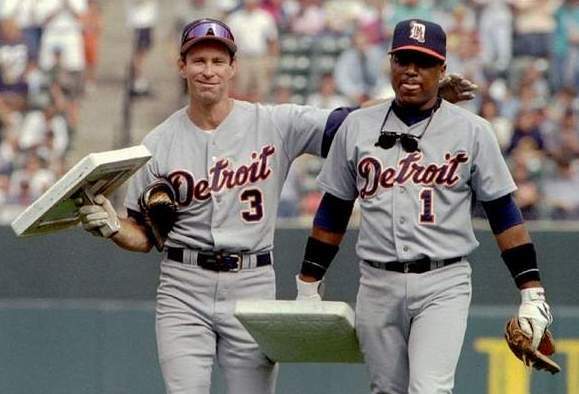 Following the 1995 season, the Tigers declined to offer arbitration to Whitaker and long-time double play partner Alan Trammell, so both men filed for free agency. Trammell eventually signed a one-year deal with Detroit, but Whitaker seemed to fade into oblivion. A search of the Google newspaper archive revealed one article in which Whitaker mentions that he would use the offseason to contemplate retirement, but an official announcement was never made. In 1994, amid the MLBPA strike, Lou Whitaker caused a stir by showing up for a union meeting in a flashy suit and white stretch limo. The media immediately seized upon the image, but Whitaker didn’t back down. “I’m rich. I make money,” Whitaker told the assembled reporters. “I got a Rolls Royce, limo, big house. What’s going to make me look bad?” Because of those statements, Whitaker was portrayed by some as being out of touch, and others cited his attitude as a reason why interest in baseball was in decline. Considering this sentiment, maybe it isn’t such as surprise that Whitaker retired in relative anonymity? And, maybe some of that resentment carried over five years later when Whitaker’s name first appeared on the Hall of Fame ballot? Who knows why Whitaker’s Hall of Fame candidacy has gotten so little support. Because he walked away near the top of his game, you’d expect the lasting impression of his career to be more positive, but perhaps the images of that white limo erased some of the memories about his Gold Gloves and Silver Sluggers? Whatever the reason, hopefully the Hall of Fame will reconsider its treatment of Whitaker so the second baseman can add a plaque in Cooperstown to his already impressive list of worldly possessions. This is terrific, bro. I didn't remember those comments that Whitaker made, and it is odd that he hasn't had a bigger case made for him over the years. Great piece, and the charts are dope. Thanks. yeah, this was great, man. I never noticed that Whitaker finished his career so strongly. His last 5 years are considerably better career averages. Maybe because the Tigers went 53-62 and 60-84 in his last 2 years people somehow stopped paying attention. I know at some point as a fan I was like "Trammell and Whitaker? They sure did get old together!" when only Trammell was playing old. In some ways I think Willie Randolph, Lou Whitaker, and Frank White all diminished the future reputations of each other. Frank White won a bunch of Gold Gloves and was on TV a bunch when the Royals were good. Willie won a ton and got the NY press. Whitaker was killing it in Detroit with less attention. Frank White was never as good offensively as Randolph or Whitaker but he was maybe better defensively. I always lump the 3 players together in my mind and no way is Frank White a HOF 2nd baseman, therefore no HOF for Willie or Lou. I'm not saying it's rational but maybe there are voters who think the same way.